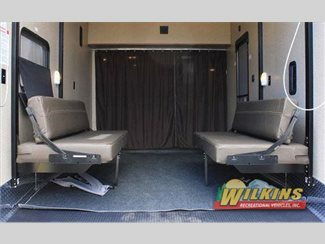 In the market for a toy hauler that guarantees an experience that outshines all others? 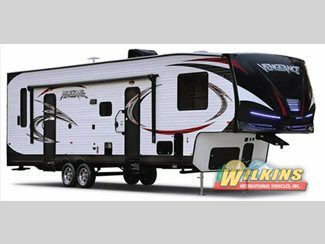 The Vengeance Super Sport toy hauler fifth wheel, by Forest River, boasts internal and exterior accent LED lighting, a LED lighted awning, an 8’6″ wide body and more. The large exterior storage space means you can bring along all of your camping essentials, without taking up any living space. Your painted fiberglass front cap with LED lighting is easy to keep clean, aerodynamic and lightweight, which means you’ll save on fuel and towing is a snap! One of the best features of this toy hauler is the kitchen. It boasts a convection microwave oven, flush mount stove, 11 cubic foot residential refrigerator, a pull down faucet and tons of counterspace. The cargo area comes with 2,500 pound tie downs, a diamond plate baseboard, tons of storage and blackout snaps for the garage windows. Indoor/outdoor carpet is attractive, but easy to wash down and keep clean. In the bathroom you’ll find a skylight over the neo-angle shower with surround. If you’re looking to relax in your bedroom after a long day, you’ll appreciate that the bedroom comes with TV hookup, a plush bed and attractive décor that’s relaxing and sure to make you feel right at home. The Super Sport also comes with a 35,000 BTU furnace, 30 amp service, 6 gallon gas/electric DSI water heater and 13,500 BTU ducted air conditioning. If you’re interested in learning about this high quality and versatile toy hauler, contact us. We can answer any questions you have and make sure you find the best floorplan for your family’s unique needs.